management; through to the consumerism of Post World War II with its ‘turn to the French’ in making things gracious; to the late 20th century counter-culture midwives and counter-cuisine cooks. The book explores the tension throughout all of these eras between the industrial demands of mass-management and profit-making, and the social movements -composed largely of women coming together from very different feminist sensibilities - which are working to expose the harmful consequences of industrialization, and make birth and food both meaningful and healthy. 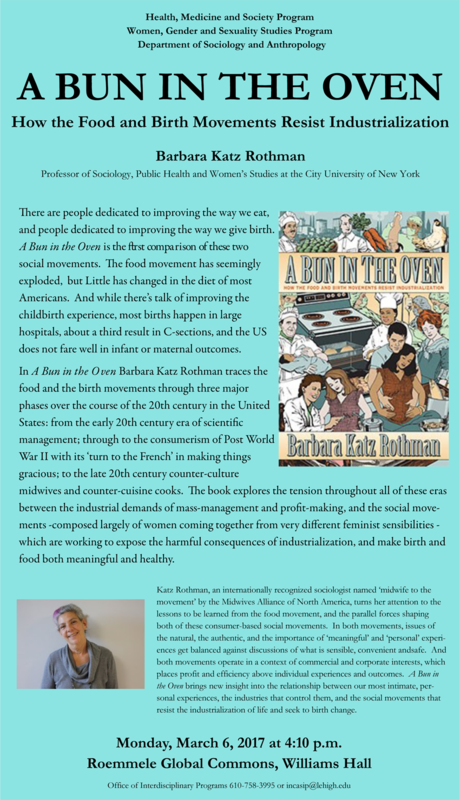 Katz Rothman, an internationally recognized sociologist named ‘midwife to the movement’ by the Midwives Alliance of North America, turns her attention to the lessons to be learned from the food movement, and the parallel forces shaping both of these consumer-based social movements. In both movements, issues of the natural, the authentic, and the importance of ‘meaningful’ and ‘personal’ experiences get balanced against discussions of what is sensible, convenient andsafe. And both movements operate in a context of commercial and corporate interests, which places profit and efficiency above individual experiences and outcomes. A Bun in the Oven brings new insight into the relationship between our most intimate, personal experiences, the industries that control them, and the social movements that resist the industrialization of life and seek to birth change.